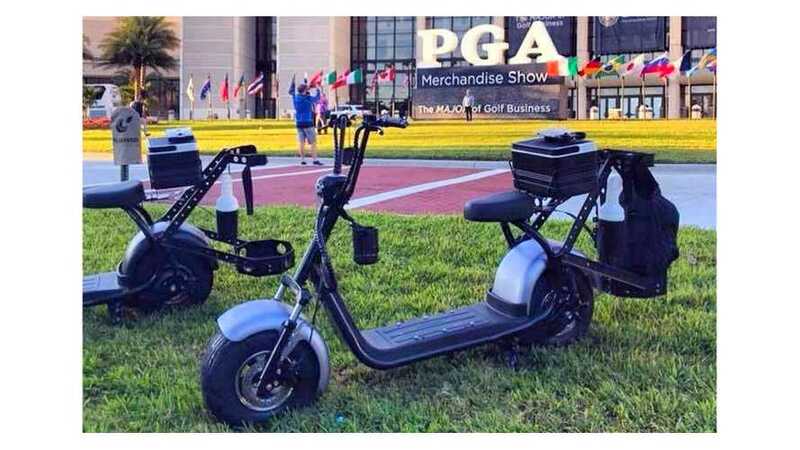 We don't cover what goes on at the annual PGA show in Orlando, Florida, but this past week two companies showed electric golf motor scooters. Despite what the Motorcycle Industry Council recently reported, everyone agrees the the average motorcycle rider is approaching retirement from riding. Could these new scooters be a subversive way to win over some new motorcycle riders? The Finn Scooter does not list a top speed, but the Phat Golf tops out at 20 mph when switched from turf to street mode, and that surely is more exciting that hitting a little ball. Now, one might think that golf and motorcycles don't have a lot of crossover, but Evel Knievel himself made a living in his later years by hustling guys on the course for money. Modern motorcycle daredevil Robbie Madison also seems to like the game, or at the very least literally "liked" some of Phat Golf's pictures on Instagram (but seriously, he enjoys playing and says the pressure of it freaks him out and gives him the chills). 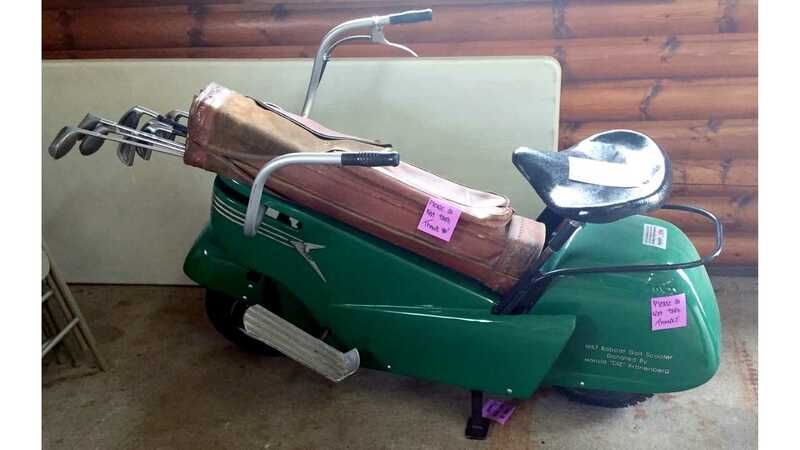 A little research turned the "Milwaukee Golf Caddy" up a rack that installs in place of a saddlebag on your Harley that came out in 2010, sells for $500, and is still being sold 8 years later, so there must be more golfers who ride out there than you'd think. Way back in the 1950 this idea was tried by Bobcat, yes the Bobcat that makes those little earth movers, with something called the Bobcat Compact Golf Car. Just like the electric Finn, the bag slipped in between the handlebars, and you straddled it. Unlike the Finn it may have been street legal, but really what wasn't back then? Under the sporty body work was a pull start 3 horsepower Kohler motor to carry you and your bag over the course and home again. Years after that failed, there was a Honda mini sidecar specifically made for carrying your golf bag while you rode a Monkey bike around the course. The Finn Scooter is coming from Sun Mountain, a company that produces bags, and the kind of golf carts that you roll behind you. 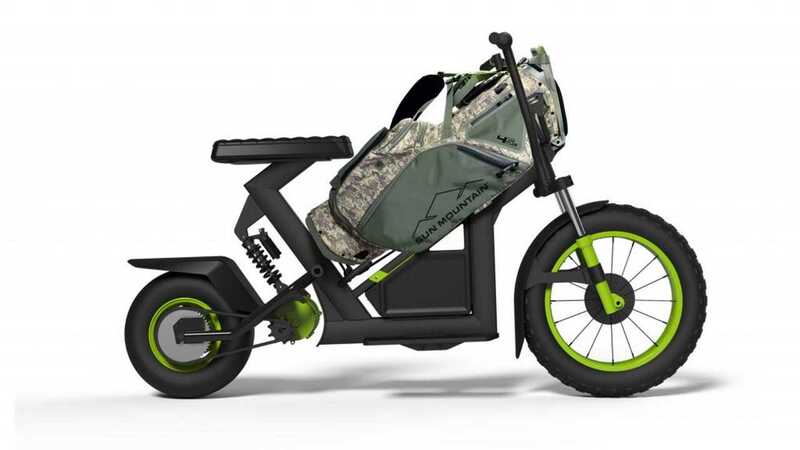 They are a company that is deeply connected to the golf industry and you would think devoted research before introducing this new two wheeled golf cart. It maxes out at 15 mph and can play 3 full rounds of golf between charges, though we aren't sure what that means in miles. The Finn copies the Bobcat, with the bag sliding down the frame between the handlebars and seat. It goes on sale this spring, or you may see it at your local course, rentable with a phone app just like a Bird or Lime. The Phat Golf is already available, being just a spin off of the line of Phat electric scooters that have been on sale for a while. In most states you can ride them anywhere you'd ride an electric scooter or bicycle, and (despite what some websites say) they have a top speed of 20 mph. On sale now, the Phat Golf is about $2,000 and can go 30-50 miles on a charge. If you don't play golf you can save a few hundred dollars and ditch the rack on the back. We don't plan on covering every electric bicycle and scooter that comes down the pike, but back in 1959 all the big bike companies ignored a little upstart called Honda when they introduced their 50cc bike via hardware stores. 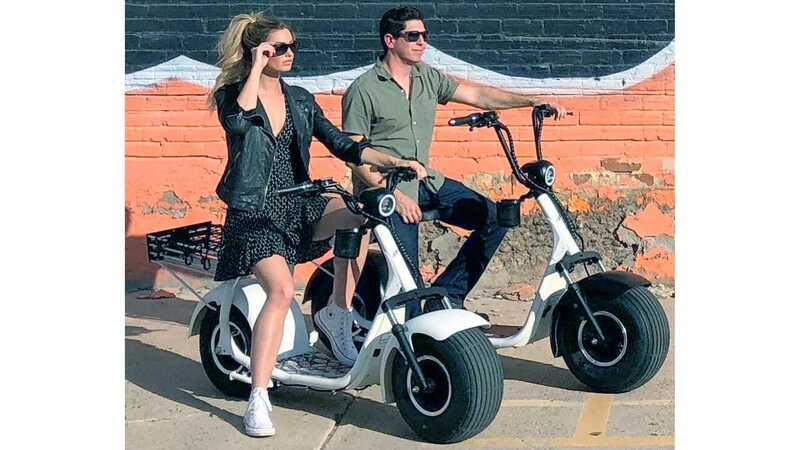 Lime and Bird electric scooters, electric assisted bicycles, and things like these golf scooters could be the gateway drug that introduces Millennials and Generation Z to the two wheeled lifestyle. Next thing you know they could be jonesing for a Zero or a Livewire. Anyone else see the similarities between the Phat and that Harley electric minibike prototype?